Take a leap of faith into a world unlike any you have ever known, one where mankind still remembers its foundations and all the earth is clothed in perpetual springtime. Here, angels and demons wage war for the souls of mankind, and man lives for hundreds of years, forever growing either in righteousness or in evil. In these days, there are few who acknowledge where they have come from, few who keep hold of the one true God who wrought the world. For those who do, the blinders are ripped off and they see the truth: a world at war. Tucked just behind the veil of sense experience, battles rage and captives are taken as kingdoms collide and man is caught in the middle, a part of the struggle but unaware of his role. The shocking part is this: it’s our world. 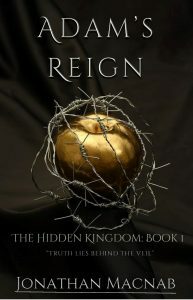 In this Christian fantasy epic, you will discover the true story behind the origins of the world and experience the adventure of the times of the great biblical flood alongside characters like Methuselah, the oldest man alive, who finds his family caught up in the conflict of the age – the war for the survival of the human race. In this fight against the forces of darkness and the deep wounds of their own souls, they will face great sacrifice and tragedy if they hope to reach the reward. Some of them will not make the journey, and those who do will never be the same. If they are to succeed they will need hope, which – in ancient earth – is a scarce commodity. In the pages of this book, much like life, you will find truth amidst fabrication, silver covered in dross. You will find yourself caught up in an epic set in a very real time in human history, populated with real people who lived, loved, and lost, some details of whom are recorded in the bible. Yet, you will doubt the words even as you read them, because the truth, sometimes, is harder to believe than a lie. So, I invite you to step into the unknown with the God of mysteries, but be careful, or you just might find out who you really are.